Spending your holiday at our house means to have time for yourself and to enjoy days of quiet and balance. Come to discover this small paradise, we are waiting for you! There is a ski bus with an alternating time table passing through our area and stopping in front of our house, so you will reach in a few minutes the stations at the bottom of the cable railways of the Alpe di Siusi and Seceda . 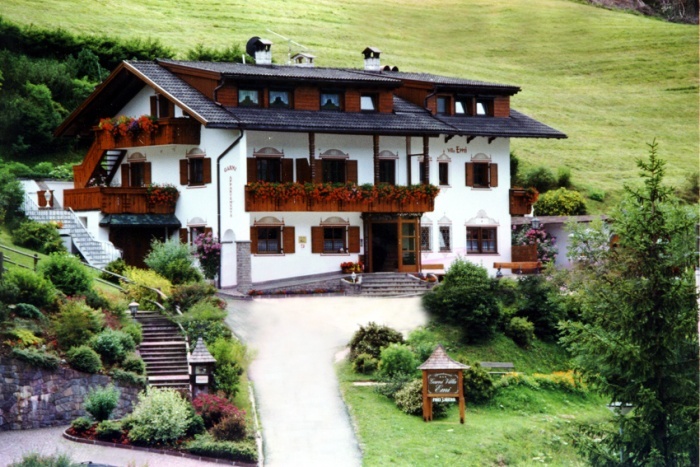 At the same time you are directly connected with the famous ski carousel of the Sella Ronda. 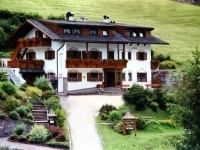 At the disposal of our guests are: a private parking ground, table tennis, bowls, *solarium, wellness sauna* (against payment), heated ski and ski boots room, in summer a bike depot, a small library with books and novels. Our comfortable garden with deck-chairs and sunshades, a barbecue for a tasty meeting with friends, is an irresistible invitation for relaxing. Consisting of: 2 double rooms (one of them with 3 beds), safe, TV-SAT, 1 bathroom with shower cabin, bidet, WC, hairdryer, towels and some bathing products; 1 bathroom with bath tube, bidet, WC, hairdryer, towels and bathing products; 1 living-room with an entirely equipped cooking area, fridge, freezer, electric cooker, electric oven and microwave oven, dishwasher, coffee machine, corner seat with a pull-out table, balconies and a terrace. Consisting of: 2 double rooms, TV-SAT, safe, 2 bathrooms with shower cabin, bidet, WC, hairdryer, towels and some bathing products; a living-room with a entirely equipped cooking area, fridge, freezer, electric cooker, dishwasher, microwave oven, coffee machine, corner seat with table, balconies. 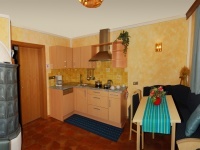 Consisting of: 1 double room, safe; 1 living-room with a large and comfortable sofa bed for 2 persons, corner seat with pull-out table, a nice furnishing and TV-SAT; there is the possibility to connect another double room with bathroom (for right 6 persons - the price to agree), a entirely equipped cooking area with fridge and freezer, dishwasher, electric cooker and oven, microwave oven, coffee machine; a bathroom furnished with bath tube and shower, bidet, WC, hairdryer, towels and some bathing products. Consisting of: 1 big double room, safe; 1 living-room with a large and comfortable sofa bed for 2 persons, corner seat with pull-out table, a nice furnishing and TV-SAT; a entirely equipped cooking area with fridge and freezer, dishwasher, electric cooker and oven, microwave oven, coffee machine; a bathroom furnished with big shower, bidet, WC, hairdryer, towels and some bathing products and a daily WC. Consisting of: 1 double room, a comfortable sofa bed for a third person, TV-SAT, safe; behind a partition wall there is a entirely equipped cooking area with fridge, microwave oven, electric cooker and gas cooker, dishwasher, coffee machine, dining area with table and seats; bathroom, furnished with bath tube and shower, bidet, WC, hairdryer, towels, some bathing products, balcony and terrace. Every appartement have a DSL hi-speed internet connection RJ45-NET line. By car: on the motorway A22 exit CHIUSA - direction VAL GARDENA - destination ORTISEI. Just before Ortisei passing the SHELL petrol station and staying on the right side, keep on driving for about 200 m. At the first crossing turn to the right - direction ALPE DI SIUSI - and keep on driving again for 200 m.